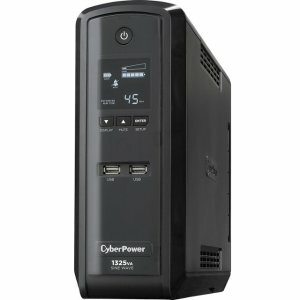 Best Buy offers the CyberPower GX1325U 1325VA Sine Wave Battery Back-Up System for $118.99. Features: Enjoy seamless uptime with this CyberPower Sine Wave battery backup. Featuring 10 outlets, this device provides protection for multiple components. Integrated data line protection keeps power surges from cables and Ethernet lines from impacting your computer setup. With its automatic voltage regulation, this CyberPower Sine Wave battery backup delivers consistent levels of sine wave power to your electronics.